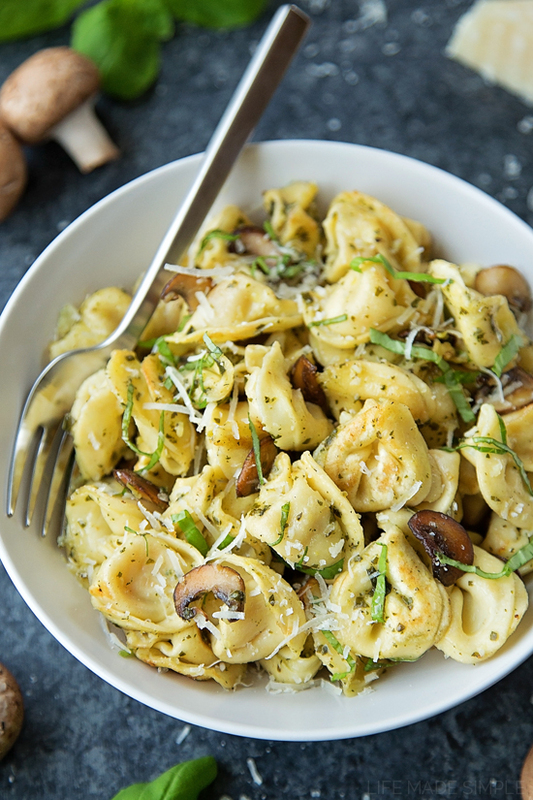 Get dinner on the table in no time with this 30 minute toasted tortellini with pesto. It only requires 8 simple ingredients! Our family is kind of obsessed with pesto. 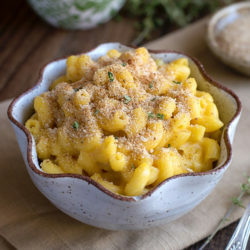 My three year old begs me to make it at least once a week, so it’s no surprise that this dish quickly became a favorite. 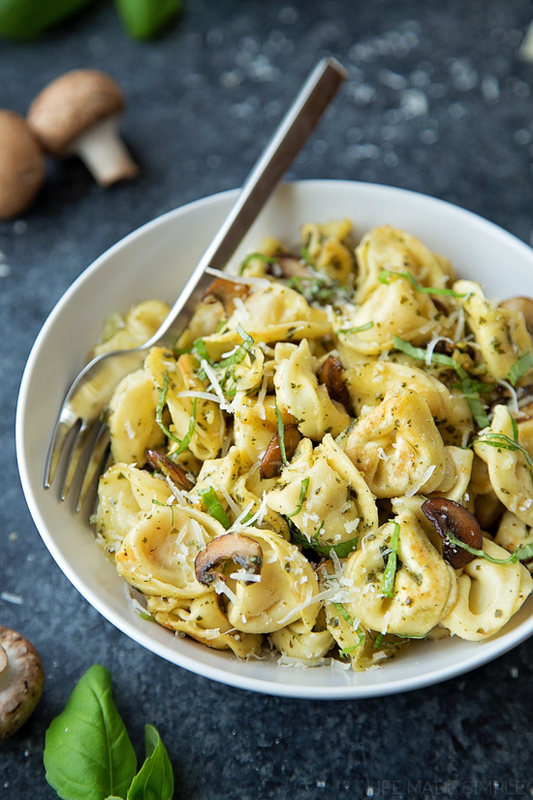 It’s super flavorful, filling, and easy to throw together- all you need is 30 minutes. What I love most about this dish is that it’s budget-friendly, wholesome and fresh! 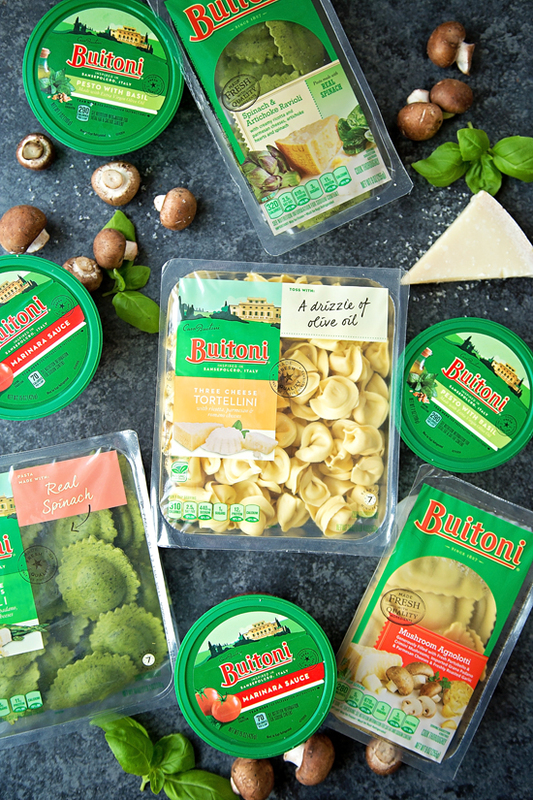 I used Buitoni’s Three Cheese Tortellini and their Pesto with Basil, both of which are convenient and speedy (bonus: no GMO ingredients). They have a huge variety of products, all of which we have tried & really enjoyed. After cooking the tortellini according to the package’s instructions, I toasted it, along with some mushrooms in a large skillet. I added a bit of freshly ground black pepper for seasoning along with 4 cloves of minced garlic. 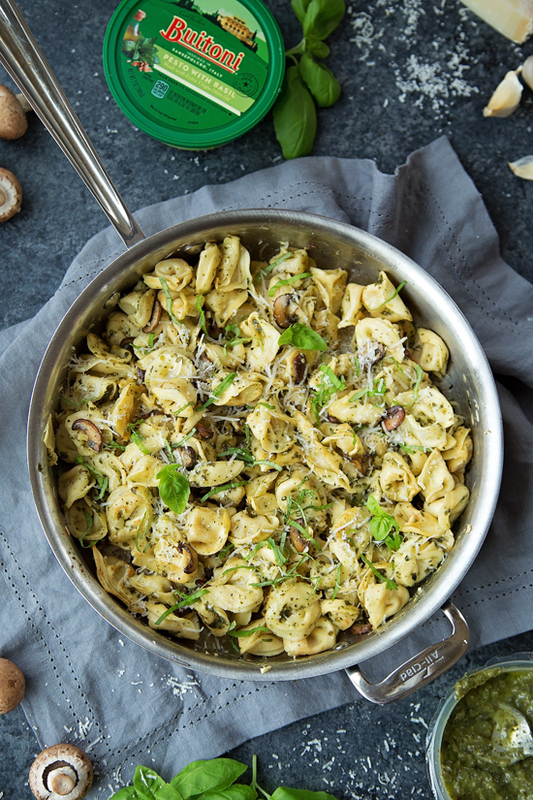 Once the garlic was fragrant, I removed the pan from the heat and tossed the pasta with the pesto. 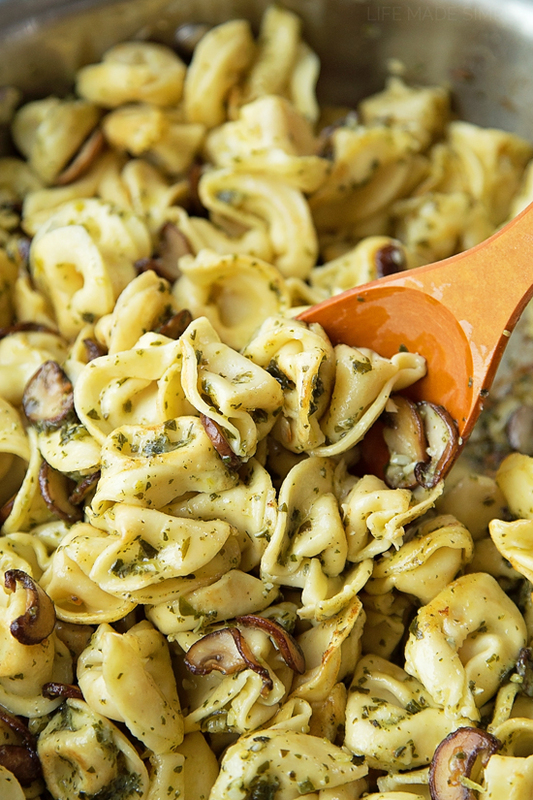 I wanted to keep things on the lighter side, so I only added about ¼ cup of pesto. If you prefer more sauce, feel free to add 1/3 cup! Some julienned basil and freshly grated parmesan really made this dish! Don’t skimp on these ingredients, trust me! 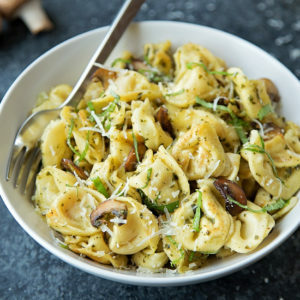 This toasted tortellini with pesto is definitely something we will be making time & time again. We ate every last bite! It had just the right amount of garlic and basil, and plenty of cheese. To make it a complete meal, we served it with a grilled chicken breast. It was a big hit! 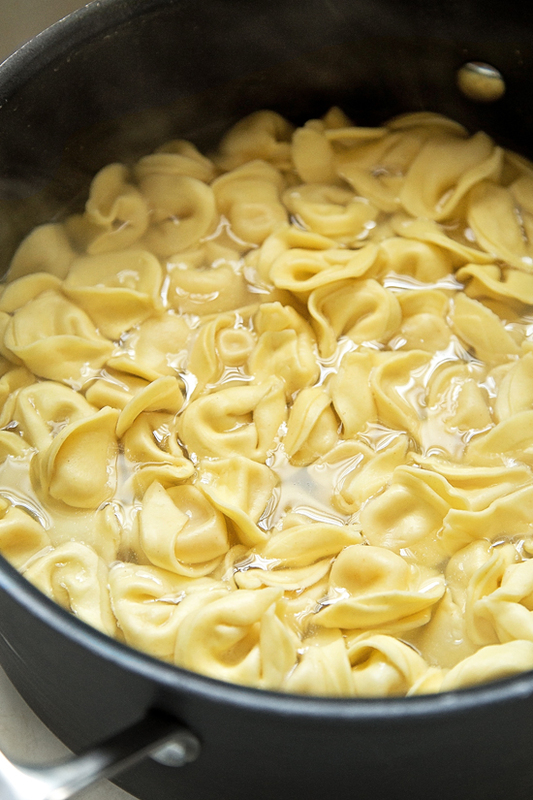 In a large pot of boiling water, cook the tortellini according to package's directions. Drain and set aside. Meanwhile, as the tortellini is cooking, melt the butter in a large skillet set over medium-high heat. Add the mushrooms and sauté for 4-5 minutes or until browned. 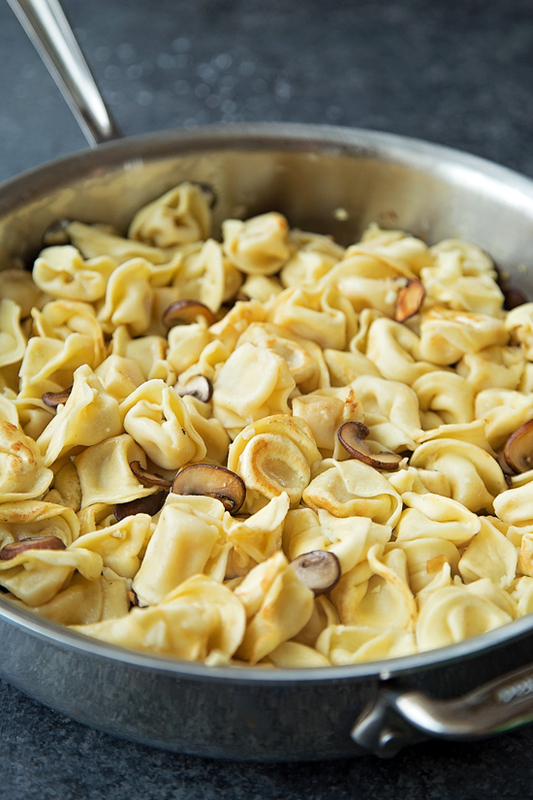 Add the drained tortellini and cook until lightly toasted and browned around the edges. Add the garlic and cook just until fragrant. Remove from the heat and stir in the pesto, basil and parmesan. Serve immediately. Want to up the protein? 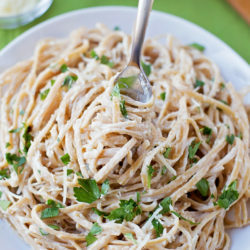 Serve this with a grilled chicken breast! This was sooooo good! I will certainly be making this more and more. My hubs does not like mushroom so I did not add them, but wish I did. Had with a lightly dressed. Very good. Definitely a keeper. Will make again. Loved this. 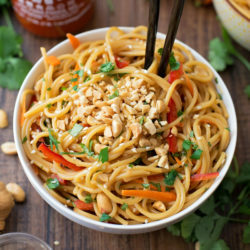 Fast, easy, and so good. I added chopped asparagus. Yummm.